The fires in Khakassia have reportedly killed 15 people, Anna Borodina from the Khakassia Health Ministry told Interfax. "A total of 613 people needed medical attendance, and 533 of them have received aid and gone home. Eight are in a grave condition. Most people suffered gas poisoning and burns," Borodina said. All fires have been put out by now, a source in the Khakassia department of the Russian Emergency Situations Ministry told Interfax. According to chief public fire inspector Boris Borzov, over 1,200 homes have burned down. 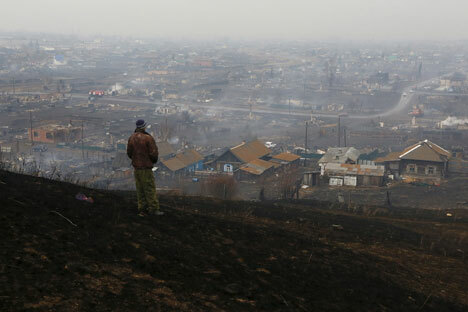 "As of today, 1,205 homes have burned down in 38 populated localities," Borzov said. More than 2,000 people are homeless, and many of them are temporarily staying with their kin, he said. The firemen protected 60,000 homes of over 350,000 people, a source in the ministry's National Crisis Management Center told Interfax. "The measures taken in Khakassia prevented the flames from spreading on 60,000 homes of over 350,000 people," the official said. Damage has been tentatively estimated at over five billion rubles ($95 million), Khakassia head Viktor Zimin said at a teleconference of the Russian Emergency Situations Ministry on Monday. Debris will be cleared and reconstruction will begin in the republic on Tuesday, he said. "We will need assistance of builders and volunteers. The construction team will have to be enlarged to 6,000 people," Zimin said. Khakassia will pay 100,000-ruble in compensation for lost property and one-time allowances of 10,000 rubles to fire victims, Russian Emergency Situations Minister Vladimir Puchkov said. "On the orders from the Russian president, every person will receive a 10,000-ruble allowance and 100,000-ruble compensation for lost property. A house restoration procedure will be established," Puchkov said at the teleconference on Monday. The fires broke out in Khakassia on Sunday, and an emergency situation regime was put into place in the republic. According to tentative reports, the fires started from grass burning.